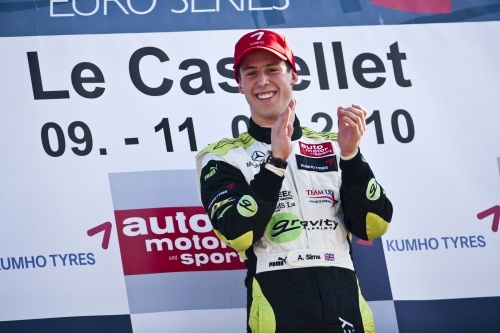 Alexander Sims came through from sixth on the grid to take victory in the second Formula 3 Euro Series race of the weekend at Paul Ricard on Sunday. The BRDC SuperStar worked his way through the field in the early laps, and took the lead from Roberto Merhi on lap seven before stretching away to take a comfortable win. Behind ART driver Alexander, race one winner Edoardo Mortara snatched second place with a stunning three-wide pass around the outside of Merhi and Marco Wittmann at Signes on the final lap. "I'm very pleased to have been able to turn things around so well after the problems of qualifying, to take two podiums from the weekend and a win as well is a great start to the year", said Alexander, "In today's race, it was crucial to make decent progress in the first few laps. I closed down (Roberto) Merhi reasonably easily and after passing him for the lead I managed to pull a good gap. "If you look at Saturday's outcome in terms of the pure result, I'm pleased, but I wasn't able to make the progress I wanted off the grid as there were three or four cars blocking across the track ahead so it took longer to get past people. The podium was a nice result though. The Volkswagen-engined cars definitely had the advantage this weekend so, all in all, I'm happy with our results."